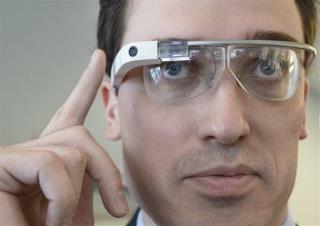 (Newser) – Can Google Glass—which includes a camera—be worn in movie theaters? One theater in Columbus, Ohio, decided not and had federal agents pull a a Glass-wearer from his seat. The agent confiscated the Glass, told the unnamed man he had been busted illegally taping the movie, and took him to a room for questioning. "What followed was over an hour of the 'feds' telling me I am not under arrest, and that this is a 'voluntary interview,' but if I choose not to cooperate bad things may happen to me," he tells tech blog Gadgeteer. Silly feds. Don't they know that most counterfeit movies from theatrical prints are done on telecines owned in China. You can pretty much get any current US theatrical release in China for 8 quy at most roadside stands. Wow, I suprised that they were able to have a federal agent dispaced to the theater so quickly. MORE fooookin' thugs with badges. When will law enforcement academies remove the upper limit on IQ's for entry ?